With fall quickly approaching, I think it’s safe to say the oversized denim jacket is still a trend that’s going strong. It first made its comeback last winter, but made its way through the summer, and is now one of the most popular staple items you can rock as the weather cools down. 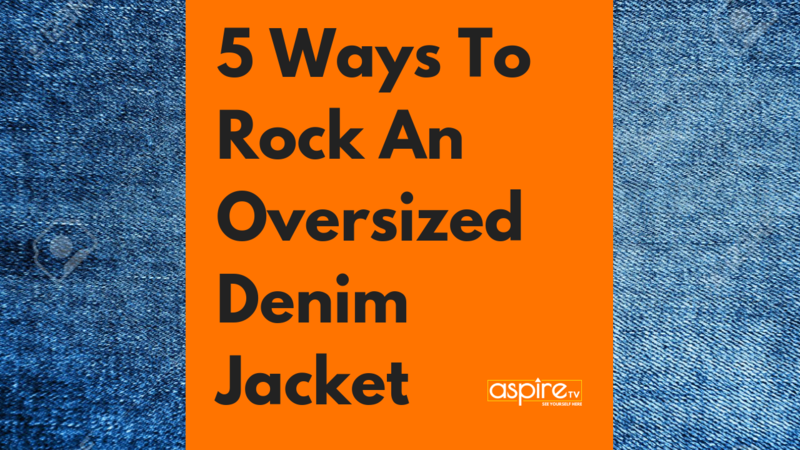 While wearing a denim jacket is pretty standard and self-explanatory, there are a few ways you can wear it that can help spice your look even more. The best part about an oversized denim jacket is that, well, it’s a little too big. This allows you to achieve the whole over the shoulder look. Because it would be a different story if it were just right. Instead, wearing a denim jacket this way can not only add flair to your look, but it can dress it up too. Whether you decide to wear it with a sleeve or strapless dress, or a tank top and jeans, it’s definitely a successful switch up from the traditional way of rocking it. Issa look! This can definitely be a go-to style for you this fall! Pairing an oversized denim jacket with an oversized sweater is a guaranteed win. As long as the sweater isn’t too big and reaches close to your knees, you’re good sis. Depending on how cold it is, you could complete the outfit with a pair of over-the-knee boots for warmth or combat boots for style. Whatever you do, just make sure your shoe has a little heel to it (even platform shoes, which are making a major comeback, could work) because straight ballet flats might not make the outfit flow the way it should. 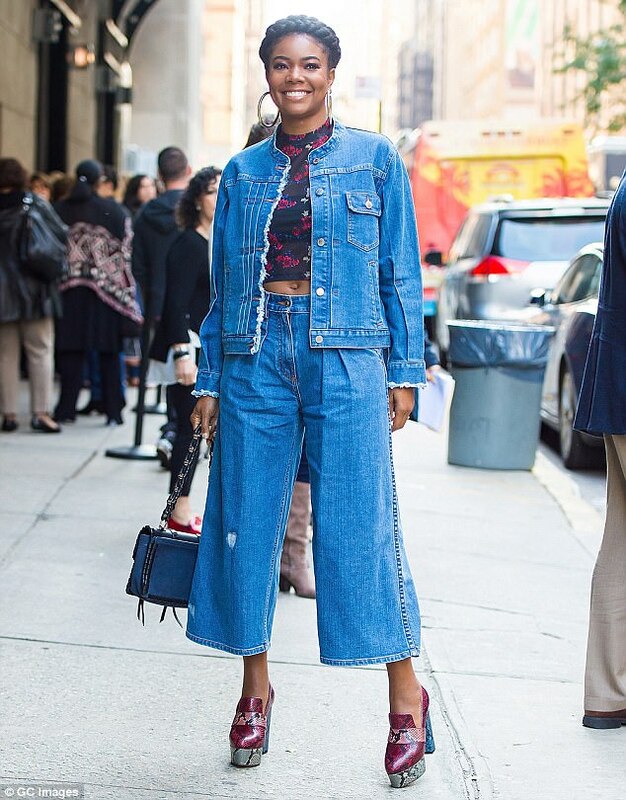 So those days of wearing matching denim are back! I remember when it was a big thing to wear these outfits when we were younger, and then it became a big no-no thanks to times like when Justin Timberlake and Britney Spears went way too far at the 2003 MTV VMAs. But now, it’s actually not terrible wearing matching denim, especially with an oversized jean jacket. If you’re not ready to jump (back) on this on-again-off-again trend, you can always pair it with a pair of jeans that’s a little lighter or darker than your jacket. The upcoming cooler months is the perfect time of year to rock a jacket this way (before we have to say goodbye to summer for what will feel like forever). Since the jacket is most likely too big, there’s plenty of room for you to button it up and let it hang a little off the shoulder. I would of course recommend leaving a couple of the top buttons unbuttoned so you don’t look uncomfortable. The more breathing room, the better. I personally love this look because it allows you to take what could be considered a bulky piece of clothing and turn it into a feminine one. If your oversized denim jacket is blue, pairing it with an all-black outfit is a win. No, it’s not necessarily bad to wear it with matching denim but opting for the all-black will help the jacket pop and give it the staple item status that it truly deserves. One of the best options for this could be a black tank top tucked into black high waisted jeans with your blue oversized denim jacket over it. It’s a casual look but still a stylish one that can be a go-to for you this fall because it will probably never get old.